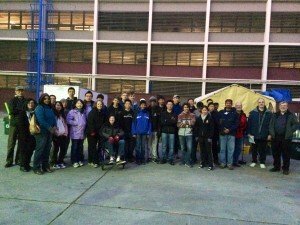 Even before the crack of dawn, before the sun’s gentle rays even touched the sky, Team 604, up and early, was already gathered at the doors of San Jose State University, in preparation for the kickoff to the season. After several tedious weeks of playing around and brainstorming about the stealthily dropped hints from FIRST, the game was finally released. FIRST was proud to announce the game, Recycle Rush! The theme behind the game is the idea of recycling, which involves teams, or “Alliances” as the game calls them, of three robots. The game is played on a 27 ft. by 54 ft. field, and divided into two equal sections, distinguishable by the coloring, red or blue. Human stations are located at all four corners. 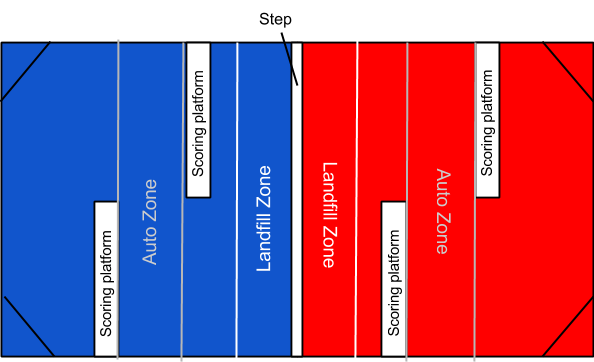 Within the field there is a Landfill Zone, an Auto Zone, and 2 scoring platforms. 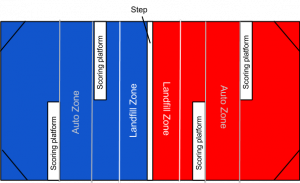 Robots score points by stacking boxes, called “totes”, onto scoring platforms, and additional points can be earned by stacking recycling containers on top of the stacks of totes. 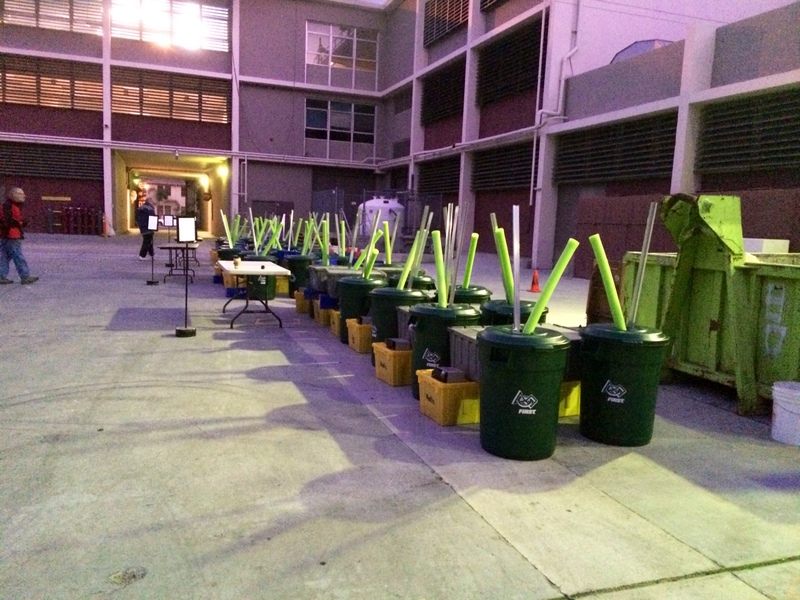 The next component is the pool noodles, also known as the “litter.” Litter is to be put either in the Landfill Zone or in the recycling bins. Alliances are required to stay on their own respective side. The first fifteen seconds is the autonomous period, where the robots operate solely on the coding in their system. During this time, robots move the yellow totes and recycling bins into the auto zone. Stacking the yellow totes scores extra points. Additionally, robots may begin to acquire gray totes and recycling bins from the Landfill Zone. After the autonomous period, is the tele-operated period. Drivers may then take the controls. 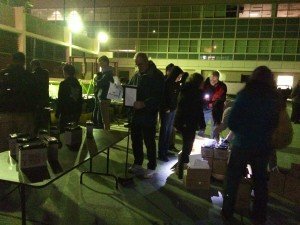 Alliances earn points by stacking totes on the scoring platforms. Each tote is worth 2 points. Totes and litter can be obtained from humans through the tote chute or the litter chute. Recycling bins stacked on top of totes are worth four points. Litter in the recycling bin on top of the totes is worth 6 points. Litter in the Landfill Zone however is worth only one point. During this time up until the last 20 seconds, opponents can also attempt to throw litter onto the opposite side. This is given relevance by the fact that by the end of the game, litter that is not in either the Landfill or the bins is counted as 4 points each to the opposing Alliance. Alliances can also choose to work together and get a 20 pt cooperative bonus by putting four yellow totes on the step, the area in between each side. Stacking the four earns a twenty-point bonus for both Alliances as well. 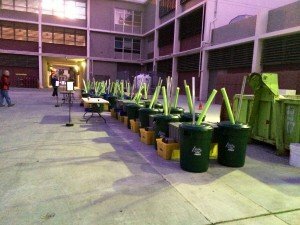 A nice addition to this year’s game, the components used in the event—the totes, recycling containers, and litter—will be recycled or reused at the end of the season, either by the teams, or by FIRST. After the presentation, Team 604 headed out to the courtyard to distribute the Kit of Parts. 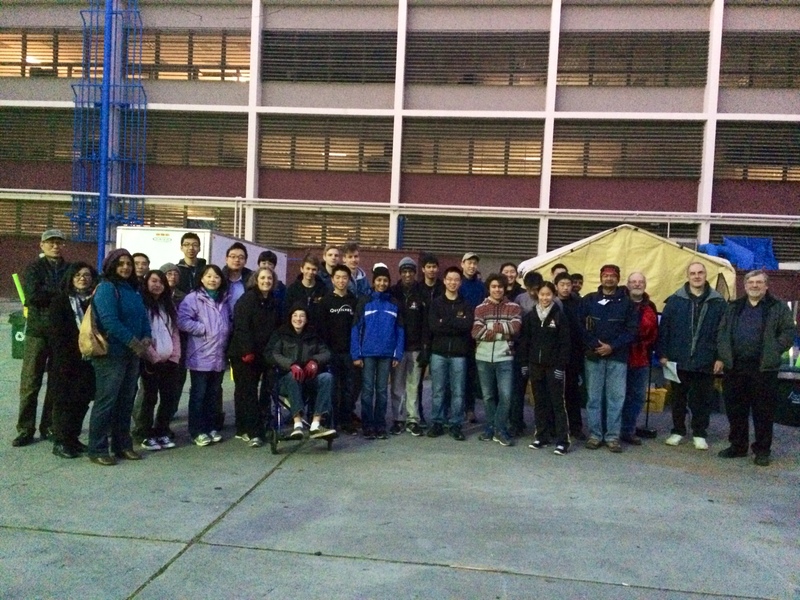 We’re looking forward to a great season, and we wish everyone the best of luck!